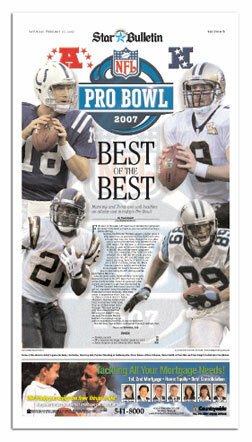 Some of the stars in today's game include, clockwise, from top left, Peyton Manning of Indianapolis, Drew Brees of New Orleans, Steve Smith of Carolina and San Diego's LaDainian Tomlinson. For most of the week, AFC head coach Bill Belichick prepared for today's Pro Bowl as hard as you can without having a player uprising. Granted, the National Football League's All-Star game is little more than an exhibition for the 50,000 fans who will jam their way into Aloha Stadium for this afternoon's nationally televised fond farewell to the 2006 season. But this man is still a competitor. No way his guys fail to cash the winners check of $40,000 because they weren't prepared. Still, if you were one of the 7,000 fans who attended the scheduled 60-minute practice sessions for the AFC and NFC teams yesterday morning, Belichick didn't show you a lot at his dress rehearsal. More time was spent on how to exit the locker room properly for today's broadcast than was on play-calling by AFC starting quarterback Peyton Manning. Like any good coach, Belichick wasn't willing to expose his hand to the NFC team that was due to arrive a half-hour later. Save it for game day when millions are tuned in to get their final football fix. The New England head coach and his staff got no argument from the players. After three days of hard workouts, they were ready to experience what Oahu has to offer on a thank God it's Friday afternoon. Practice lasted a half-hour in what was little more than an abbreviated walk-through. The most exciting play was a flea-flicker that Manning completed to Indianapolis teammate Marvin Harrison that brought an appreciative response from the all-star-craved crowd. Minutes later, they formed a halfhearted huddle at midfield, then exited the stadium with more giddy-up in their step than they came with as a small horde of national media descended upon them for that final quote. Belichick was in a good enough mood to answer a few questions from the inquiring minds of the media. He had a bemused expression on his face when asked how prepared his team will be for today's 1 p.m. get-together. "You only have these guys for less than a week, so you don't have that much time to get ready," Belichick said. "I think we've all enjoyed spending this time together. It's fun to get to know the players and their families. Frankly, I'd much rather be coaching in last week's game (Super Bowl XLI) than this week. It's nice to be in Hawaii, but the Super Bowl is where all of us want to be." 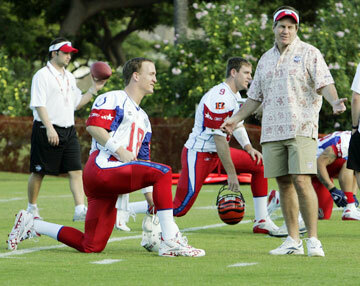 Indianapolis Colts quarterback Peyton Manning (18) stretched as he talked with head coach Bill Belichick of the New England Patriots during AFC practice for today's Pro Bowl. Manning and Belichick have had a playful week, despite Indianapolis knocking New England out of the playoff picture on a late drive by the Colts quarterback. As hard as it was for Belichick to say, he congratulated Manning and his Colts teammates at Wednesday's practice for winning the Super Bowl and keeping it in the AFC family. You don't figure Manning to play much beyond the first quarter, giving way to fellow quarterbacks Carson Palmer and Vince Young. Harrison and Reggie Wayne of the Colts will serve a backup role to starting wideouts Andre Johnson of Houston and Chad Johnson of Cincinnati, but don't be surprised if the three Indianapolis players see some playing time together before the day is done. San Diego running back and league MVP LaDainian Tomlinson will get a few looks, as will fellow rushers Larry Johnson of Kansas City and Willie Parker of Pittsburgh. "It's great to be here in Hawaii among all these talented players," Tomlinson said. "We're going to have some fun this weekend. You know that. To be recognized by your peers as one of the best at your position is an honor." Starting NFC quarterback Drew Brees feels the same way. After missing last year's game with a shoulder problem, Brees welcomes the opportunity to showcase his talent in today's game. Having your head coach with you doesn't hurt your chances of being successful. At least NFC head coach Sean Payton sees that as an advantage. "Anytime you have the quarterback calling plays in your system, it helps," said Payton, who led the surprising Saints to the NFC title game in his first year as head coach. "He's comfortable in what we're doing and he's going to help the players around him get comfortable as well." Brees will likely see more playing time than Manning, but when he does give way, Marc Bulger of St. Louis and Tony Romo of Dallas will be more than ready to take the next snap. All three quarterbacks will be throwing to a contingent of talented receivers, led by starters Steve Smith of Carolina and Donald Driver of Green Bay. 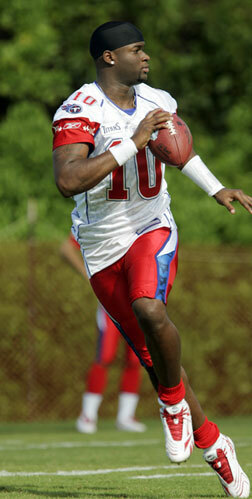 Tennessee rookie quarterback Vince Young is sure to see a lot of action for the AFC squad in today's all-star classic. San Francisco 49ers running back Frank Gore will get the start, but look for all eyes to be on Tiki Barber of the New York Giants, who's playing in the final game of his NFL career. Steven Jackson of St. Louis will also see plenty of playing time today. "We're going to have some fun out there," Payton said. "I think this is one of those games that starts out one way, but ends another. These guys are very competitive at what they do. They want to win and I think you'll see that kind of competitiveness come out in them as the game moves along." By most accounts, the NFC has taken it a little easier in practice this week than the AFC, although yesterday was an exception when compared to Belichick's light workout. The NFC spent most of its allotted hour working on a variety of things, including special teams play. Chicago Bears return man Devin Hester could electrify the crowd today with his ability to take it to the house. On one kickoff return, Hester was practicing taking it upfield when Romo playfully stepped in to fill the gap. You have to wonder what Belichick has up his gray sweatshirt to deal with one of the few Bears to make the trip. Chicago linebackers Brian Urlacher and Lance Briggs, along with center Olin Kreutz, decided to sit this one out after last Sunday's disappointing Super Bowl loss to Indianapolis. "You know, we all want to win the Super Bowl," Payton said. "But this isn't a bad consolation prize. It's been good to see all these outstanding players in this wonderful setting. I'm looking forward to the game and see what these guys can do." 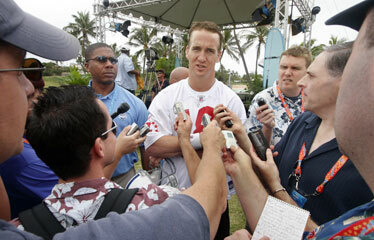 Colts quarterback Peyton Manning was the center of attention after the AFC practice on Thursday. 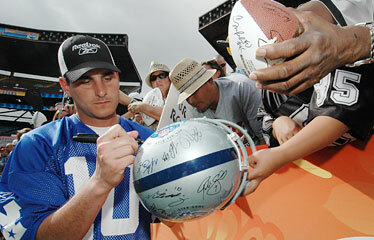 St. Louis Rams quarterback Marc Bulger signed autographs for fans after an NFC practice for today's all-star game. Attempts, Career: 81, Walter Payton, Chicago 1977-81, 1984-87. Attempts, Game: 19, O.J. Simpson, Buffalo (1974). Yards Gained, Career: 368, Walter Payton, Chicago 1977-81, 1984-87. Yards Gained, Game: 180, Marshall Faulk, Indianapolis (1995). Touchdowns, Career: 3, Earl Campbell, Houston 1979-82, 1984; Chuck Muncie, New Orleans 1980, San Diego 1982-83; Mike Alstott, Tampa Bay 1998-2001. Touchdowns, Game: 3, Mike Alstott, Tampa Bay (2000). Longest Run From Scrimmage: 49 yards (TD), Marshall Faulk, Indianapolis (1995). Attempts, Career: 134, Peyton Manning, Indianapolis 2000-01, 2003-06. Attempts, Game: 41, Peyton Manning, Indianapolis (2004). Completions, Career: 79, Peyton Manning, Indianapolis 2000-01, 2003-06. Completions, Game: 22, Peyton Manning, Indianapolis (2004). Yards Gained, Career: 1,131, Peyton Manning, Indianapolis 2000-01, 2003-06. Yards Gained, Game: 342, Peyton Manning, Indianapolis (2004). Longest Completion: 93 yards, Jeff Blake, Cincinnati (to Yancey Thigpen, Pittsburgh), 1996 (TD). Touchdown Passes, Career: 12, Peyton Manning, Indianapolis 2000-01, 2003-06. Touchdown Passes, Game: 4, Marc Bulger, St. Louis (2004). Interceptions Thrown, Career: 8, Dan Fouts, San Diego 1980-84, 1986; Peyton Manning, Indianapolis 2000-01, 2003-06. Interceptions Thrown, Game: 5, Jim Hart, St. Louis (1977). Receptions, Career: 37, Jerry Rice, San Francisco 1987-88, 1990-94, 1996, 1999; Oakland 2003. Receptions, Game: 9, Randy Moss, Minnesota (2000). Yards Gained, Career: 495, Jerry Rice, San Francisco 1987-88, 1990-94, 1996, 1999; Oakland 2003. Yards Gained, Game: 212, Randy Moss, Minnesota (2000). Longest Reception: 93 yards, Yancey Thigpen, Pit., from Jeff Blake, Cin., (1996). Touchdowns, Career: 5, Jimmy Smith, Jacksonville, 1998-2001; Marvin Harrison, Indianapolis 2000-06. Touchdowns, Game: 3, Jimmy Smith, Jacksonville (2000). Interceptions, Career: 4, Everson Walls, Dallas 1982-84, 1986; Deion Sanders, Atlanta 1992-94; San Francisco 1995; Dallas 1999. Interceptions, Game: 2, Mel Blount, Pittsburgh (1977); Everson Walls, Dallas (1982 and 1983); LeRoy Irvin, L.A. Rams (1986); David Fulcher, Cincinnati (1990); Brian Dawkins, Philadelphia (2000); Rod Woodson, Oakland (2003). Touchdown Returns, Game: 1, held by 15 players. Longest Return: 87 yards, Deion Sanders, Dallas (1999). Punts, Career: 33, Ray Guy, Oakland 1974-79, 1981. Punts, Game: 10, Reggie Roby, Miami (1985). Longest Punt: 73 yards, Shane Lechler, Oakland (2002). Returns, Career: 13, Rick Upchurch, Denver 1977, 1979-80, 1983. Returns, Game: 7, Vai Sikahema, St. Louis (1987). Return Yards, Career: 183, Billy Johnson, Houston 1976, 1978; Atlanta 1984. Return Yards, Game: 159, Billy Johnson, Houston (1976). Touchdown Returns, Career: 2, Mel Renfro, Dallas 1971-74. Touchdown Returns, Game: 2, Mel Renfro, Dallas (1971). Longest Return: 90 yards (TD), Billy Johnson, Houston (1976). Returns, Career: 17, Michael Bates, Carolina 1997-2000. Returns, Game: 8, Derrick Mason, Tennessee (2004). Return Yards, Career: 488, Michael Bates, Carolina 1997-2000. Return Yards, Game: 228, Jerry Azumah, Chicago (2004). Longest Return: 66 yards, Michael Bates, Carolina (2000). Opponent Fumbles Recovered, Career: 3, Randy White, Dallas 1978-86. Touchdown Returns, Career: 1, Art Still, Kansas City (1985); Keith Millard, Minnesota (1990). Longest Return: 83 yards (TD), Art Still, Kansas City (1985). Most Points: 55, NFC (2004). Fewest Points: 3, AFC (1984, 1989, 1994). 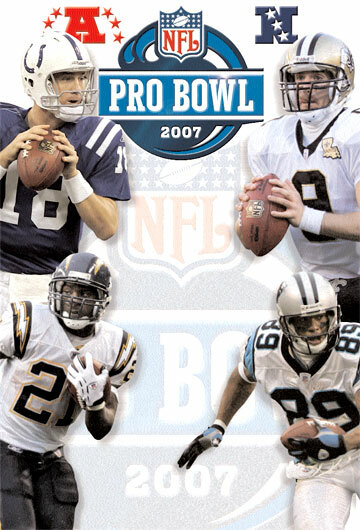 Most Points, Both Teams: 104, NFC 55, AFC 62 (2004). Fewest Points, Both Teams: 16, AFC 10, NFC 6 (1987). Touchdowns: 7, NFC and AFC (2004). Fewest Touchdowns: 0, AFC (1971, 1974, 1984, 1989, 1994); NFC (1987, 1988). Touchdowns, Both Teams: 14, NFC 7, AFC 7 (2004). Fewest Touchdowns, Both Teams: 1, NFC 1, AFC 0 (1974); AFC 1, NFC 0 (1987); AFC 1, NFC 0 (1988). Field Goals: 5, AFC (1974). Field Goals, Both Teams: 7, AFC 5, NFC 2 (1974). Field Goals Attempted: 6, AFC (1972), NFC (1981, 1983). Field Goals Attempted, Both Teams: 9, NFC 6, AFC 3 (1983). Most PATS: 7, AFC (2004). Most PATS, Both Teams: 12, AFC 7, NFC 5 (2004). Total Yards Gained: 626, AFC (2004). Fewest Yards Gained: 114, AFC (1993). Yards Gained, Both Teams: 1,022, AFC 626, NFC 396, (2004). Fewest Yards Gained, Both Teams: 424, NFC 222, AFC 202 (1987).